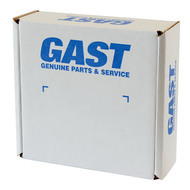 Gast K263 service/rebuild/repair kit returns your unit to original factory performance specifications. Recommend for service every 2 years. Kit contains components to service both cylinders. Service kit includes: Gaskets, felt spacers, valves, seals, rings, rider ring, instructions.